NOTE: Sony® has previously attempted in the past to 'block' third-party hardware via Firmware Updates. Before updating your PlayStation 3 firmware, please visit this page. Though we have done everything possible to avoid compatibility problems with our hardware, we cannot guarantee or protect against Sony® 'bricking' your adapter. Programming is for the PC/Mac™ only, and has no function on game consoles. The Trackball is not supported by the 2in1 X-Adapter™. You may however be able to use the trackball in the USB port of your console directly. PlayStation 3: You will need to press Select+Start on the X-Arcade™ when you first plug in the controller or turn on the PS3 system (Lights flashing), and anytime you see "Press the PS Button" displayed on the screen. To access the PS3 Cross Media Bar (XMB) during gameplay, simply press Select+Start on the X-Arcade. You can also press and hold Select+Start to access the PS3 system menu. To reassign controllers, (using the controller you want to reassign) go to "Settings" in the XMB, go to "Accessory Settings", and choose "Reassign Controllers". Simply change to the number you prefer. See "Player Assignment" in the layout above for LED color association. To switch between Analog and Digital modes during a PS1 or PS2 game, press Select+Start, choose "Controller Settings" then "Switch Analog Mode". You can also reassign controllers from this menu. 4-player: If your PS3 console only has 2 USB ports, you will need to use a USB hub to connect for 4-players. PlayStation 3: You will need to press Select+Start on the X-Arcade™ when you first plug in the controller or turn on the PS3 system (Lights flashing), and anytime you see "Press the PS Button" displayed on the screen. To access the PS3 Cross Media Bar (XMB) during gameplay, simply press Select+Start on the X-Arcade. You can also press and hold Select+Start to access the PS3 system menu. On gaming consoles, the unit operates just like a standard gamepad, with buttons assigned to the arcade buttons. See the appendix for the appropriate button legend for your game system. You can play with four players using two X-Arcades™ and two 2in1 X-Adapters™. Some games may require the use of 2 control devices simultaneously, for example console versions of arcade classics like Robotron™, SmashTV™, Crazy Climber™, and Karate Champ™. While the X-Arcade™ is not ideal for all types of games, for example first-person shooters, it now has the ability to play all of them thanks to the new DualStick Mode. DualStick Mode makes the second player joystick of a dual X-Arcade™ act like the right analog thumbstick on a gamepad. But it also makes the buttons on the player 2 side mirror those of the player 1 side, so the buttons on both sides can be used for single-player gameplay. 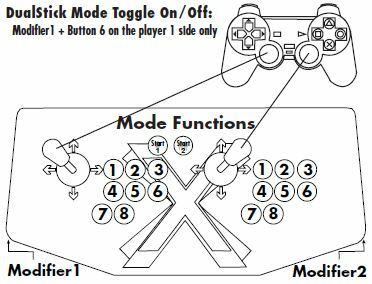 As you may have gathered, this means that DualStick mode is for single-person gameplay, and requires a 2-player X-Arcade™ controller, it will have no affect on an X-Arcade Solo™ for example. CoinOps is the ultimate emulator for the original Xbox console! It plays MAME arcade games and a whole host of console titles as well, all with a gorgeous frontend. It even has trackball support for the X-Arcade Tankstick, you will just need a USB-Xbox adapter cable. This will require your Xbox be soft-modded or have a modchip in it. The first thing you want to do is test the X-Arcade™ on your PC using the X-Arcade™ Test Utility Program to check that all buttons are working properly, especially the Select and Start buttons. If your controller works in the X-Arcade™ Test Program, then your controller is fine. Run the X-Arcade™ Test Program. Make sure all of your connections are tight and secure. If the X-Arcade’s™ LED light is on, you should have a secure, tight connection. THE ADAPTER IS JUST FLASHING! You must press Select+Start to initialize the adapter and make it stop blinking. If this is still not working, unplug the 2in1 adapter from the PS3 console, turn off your PS3 completely by turning off the main power switch on the back of the PS3 console, wait a few seconds before turning it back on. Then once fully booted to the XMB menu, plug the 2in1 back into the console and try initializing it again. If it still does not work, try your controller on our test program to make sure all of the buttons are working, especially the Select and Start buttons. You can also use the PC USB cable that came with your X-Arcade™ to see if you can move around the main XMB menu on the PS3, this will tell you if your PS3's USB ports are working properly. I CAN’T MOVE AROUND IN THE GAME MENU! The game you are playing may require that you use the digital control to navigate the menu, you might be in analog mode (or vice-versa). Change the mode of your joystick as instructed. THE CONTROLLER IS NOT WORKING ON MY PS3 GAME! Make sure that controller that you are trying to use is assigned to player 1. Some games can only be controlled with the controller assigned to controller 1. If the game will not start, reassign the controller to player 1. MY CONTROLLER IS NOT WORKING ON PSX GAMES! Some older PSX games need to use True Digital mode. HOW DO I ACCESS THE PS3 BUTTON FUNCTIONS? To access the PS3 Cross Media Bar (XMB) during gameplay, simply press Select+Start on the X-Arcade. You can also hold Select+Start to access the PS3 system menu. PLAYER 1 AND PLAYER 2 CONTROLS ARE REVERSED! You either need to reassign your controller, have the cables reversed (Xbox only), or you are in DualStick Mode. The 2in1 adapter does not have native USB support for PC use, but with a special driver you can use it on your PC. Keep in mind that when it is connected this way, the X-Arcade acts as a GamePad instead of a keyboard.